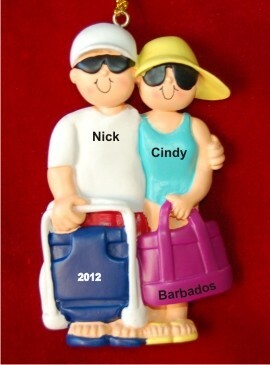 Happy smiles and bright colors along with your custom details make the beach couple personalized Christmas ornament a winner! These quality resin Christmas ornaments are some of our most popular travel and beach ornaments personalized as special memories of a wonderful trip. We'll hand letter the front as shown, and there is room on the back of the beach couple personalized ornament for a meaningful message that adds lasting significance!